On the CD label there is a title mistake: "Hexeri" instead "Hexerei"
I feel like this has received somewhat of a renewed appraisal recently, first for me with a shoutout some time ago (probably forgotten by most) from Sunn O)))'s Stephen O'Malley, and even more recently with it's inclusion in many a list as a prime example of circum-classic dungeon synth-era black-metal influenced dark ambient (however don't expect this to be anything like early Mortiis or any "true" dungeon synth). Regardless I find it as a real standout in Cold Meat Industry's discography that has aged very well. Very little music I have found is anything near this. It's far too intense to even approach sort-of new agey stuff like Arcana, and it falls into none of the tropes of "death industrial" from this era either. Only thing I can even try to compare it to would be some of Les Legions Noires voice-based ambient projects like Moëvot or Aäkon Këëtrëh, but it's light years better in quality, and extremely minimal in anything that would seem corny or camp to modern ears. Definitely worth checking out even if you dislike most CMI stuff. One of the most impressive dark ambient sound I've hearded. Between oniric and weird. Dark Ambient music from this one-off album by two mysterious women was used in the horror flick, Sinister. This album is hauntingly beautiful to me, but not for the feint of heart. Dark ambient with witches voices - The music is Creepy and Beautiful. these voices express feelings of loss and grief. The only track with Rhythm is Totentanz , on this track there is a combination of timpani drums and a ritual ceremony. Listening to the music gives you the feeling that you are walking through a Haunted forest ... You know you will never find your way out because something terrible is going to happen. This is the most scary album ever made and by 2 women..no need more words to Add. Back in the late 1990's I read a review upon this album in one Polish zine (Thrash 'em all) which rated it 1/10 and claimed as pointless non-music. I still remember I was so happy a metalhead was frustrated and he suffered through at least one listen to arrange his ideas in the negative review. Well, time has passed and the record seems retaining its originality, passion and elusive beauty despite the hackneyed ideas of minimalism, simplicity and primitivism behind the project. To achieve its powerful status it should have emerged unto the surface of the macabre dark ambient only in those times: the attitude was different, the production was low-fi, and the result was bewitching. It is cryptic and hellish ambience (and hopefully it still haunts the poor metalhead.) Time also has proved that such a record despite many attempts can't be imitated or revisited by anyone, even by the very authors. Classics. 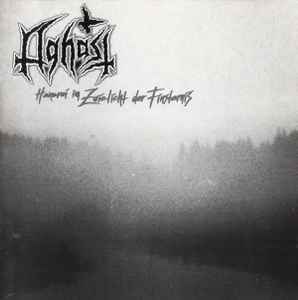 Hauntingly dark ambient industrial, with female vocals which are supposed to emulated calls from beyond the grave.